We appreciate the feedback we receive from Calculators users. It allows us to continually improve the online Calculators, and look at ways to make them more useful to our customers. Read about the latest changes, below! Formatting: Some combinations of browsers and operating systems caused pages to display an additional scroll bar inside the frame, making navigation cumbersome. Page lengths have been adjusted. In tests of Chrome (Mac OS, Windows 7, and Windows 10), Firefox (Mac OS, Windows 7, and Windows 10), and Safari (Mac OS), these changes greatly improve navigation. Printing: The NP Multi Calculator, the Pump Sizing Calculator for Flow Centers, and the Two Units with One Flow Center Calculator were not printing the entire page. Updates to formatting improves printing in Chrome (Mac OS, Windows 7, and Windows 10), Firefox (Mac OS, Windows 7, and Windows 10), and Safari (Mac OS). For best results, Geo-Flo recommends Chrome or Firefox browsers. In most cases Safari works fine, but there are some formatting issues. Internet Explorer and Edge are not recommended, as these browsers have formatting issues, and sometimes cause the inputs to display incorrectly. 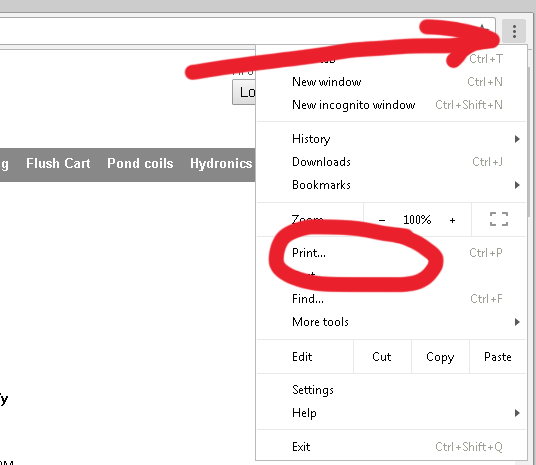 Most Windows browsers have a menu in the corner that has a print option (see graphic below). Alternatively, right clicking on the page will typically provide an option to print the page. For Mac browsers, select "Print" from the "File" menu. The latest Geo-Flo catalog has been uploaded to the website. There are many new geothermal and hydronic products, some of which are highlighted below. One of the biggest challenges in our industry right now is finding installation and service techs. Geo-Flo's product development efforts over the past few years have focused on labor-reducing solutions. Check out the latest products in the catalog that can help decrease installation time and increase your competitive advantage. Let us know if we can be any assistance. The Magna3 insulated pump product line has expanded to many more options. Above are examples of labor saving and application specific options. The assembly on the left is a high head version (two pumps in series -- Model M3H) factory-assembled on a floor mounting stand. The assembly on the right is a dual head version (two pumps in parallel -- Model M3D) factory-assembled on a floor mounting stand for horizontal flow. In mechanical rooms with limited space, horizontal mounting can avoid additional elbows. All Magna3 insulated pumps include foam insulated cabinets to help prevent condensation at low temperatures for geothermal applications or chilled water hydronic applications. Isolation ball valves or butterfly valves are included with the package. ECM motor technology provides an efficient and lower cost alternative to standard VFD style pumps. 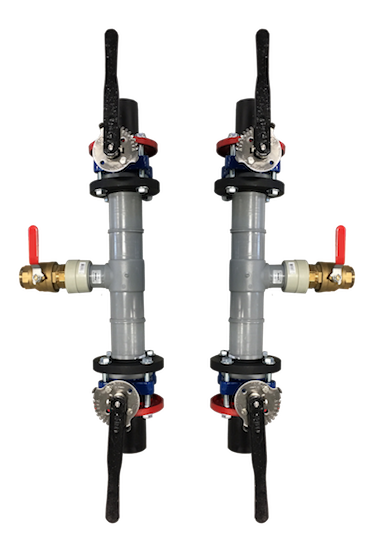 New 3" and 4" flushing assemblies provide turnkey solutions for commercial and large residential applications, especially when combined with Magna3 insulated pumps. Ground loop connections are HDPE fusion with flanged 3" or 4" butterfly valves. Flush valves are 2" brass ball valves. 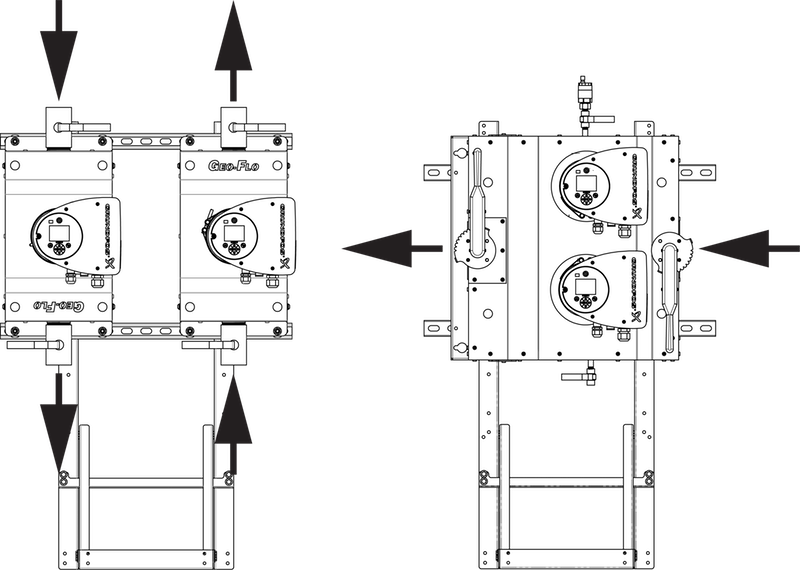 The body of the assembly (gray/white piping) is PP-R (polypropylene-random) with factory fusion connections to the components. 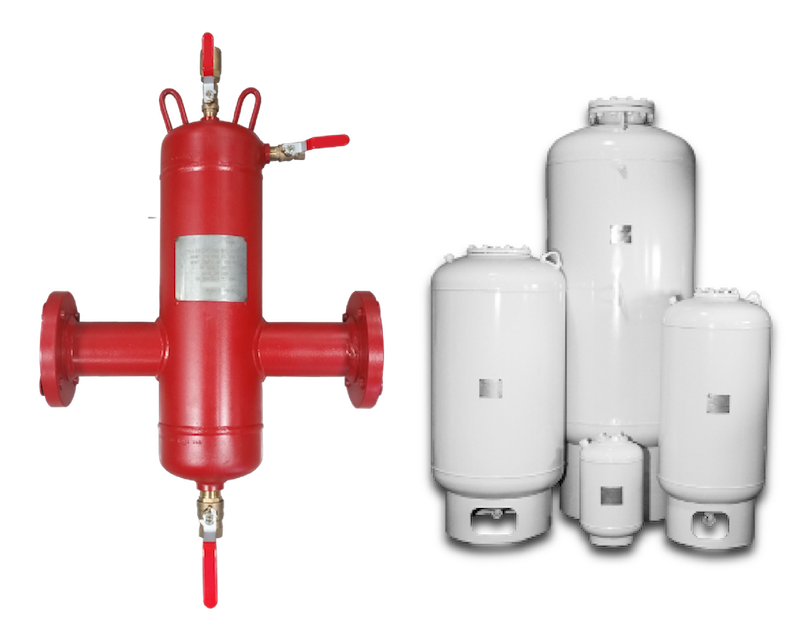 Geo-Flo offers air separators, hydraulic separators, and expansion tanks to complete the installation for commercial and large residential applications. Contact your Geo-Flo distributor or representative for a quote on your next geothermal or hydronic application, and package the entire job. 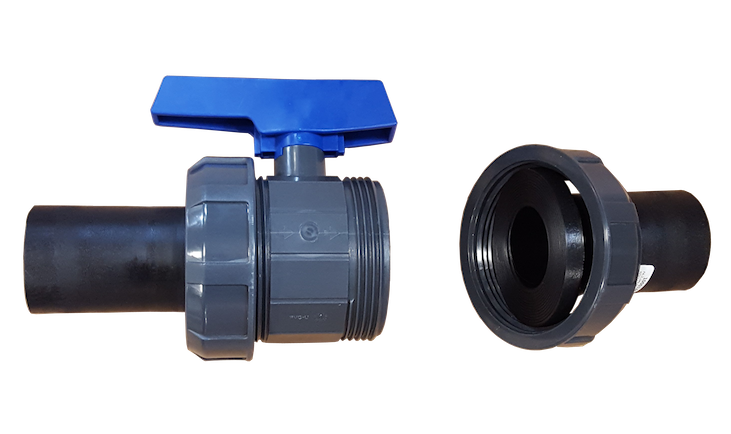 New union style fusion ball valves for 1-1/4" and 2" HDPE are now available. Union connections make installation easier than standard fusion ball valves. The ball valve is schedule 80 PVC. A new section has been created in the price book for Geo-Flo's selection of valves. Geo-Flo is always looking for ways to make geothermal and hydronic installations easier. Most of the piping adapters in the catalog are designed and manufactured in our facility in Bedford, Indiana. We depend upon customer feedback to help determine what fittings/adapters are needed. Above are two new HDPE fusion by pipe thread elbows that have just been added to the catalog. New bracketed pumps are available for hydronic applications. Especially with PEX piping, wall mounted pumps can be very helpful. Pictured above is the Grundfos UPS15-58FC pump mounted on brackets with 3/4" FPT connections for heating only hydronic systems. Also available are bracketed UPS26-99 pumps. Pump brackets for UP(S) 15 and 26 series pumps are sold separately, as well (see flange and adapter section in Accessories/Pipe/Fittings). 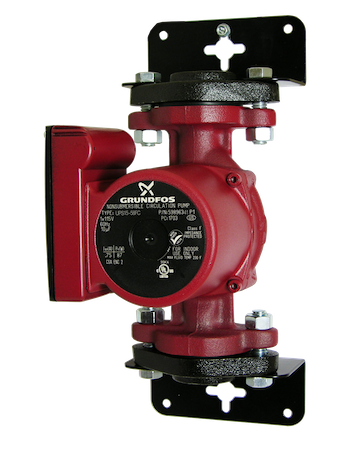 For systems with chilled water, review Geo-Flo's selection of insulated pumps. We wish you a Happy 2018! Copyright © 2017 Geo-Flo Products Corp., All rights reserved.